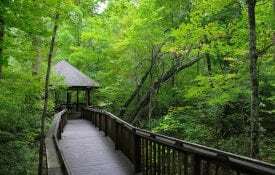 AUBURN, Ala. – Have you ever been outside at night and heard a soft hoot coming out of the darkness? It was probably one of the several species of owls that call Alabama home. There are several things that people can look for to help identify what owl is hooting in their backyard. 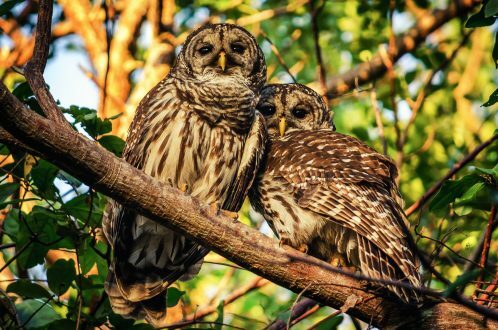 Dr. Jim Armstrong, an Alabama Extension wildlife specialist, said there are four species of owls commonly found in Alabama. Owls have several characteristics that make them excellent hunters. They have asymmetrical ear placement which allows them to use sound to find their prey. An owl’s eyes are located on the front of their face which allows them to focus on objects. Their feathers have slots that let wind pass through so they make no sound in flight. All of these things allow owls to capture prey easily. Armstrong said that an owl’s diet depends on the species. Generally, when people picture an owl, they think of the great horned owl. 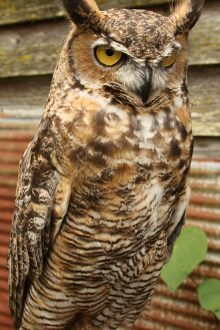 One of the larger owls in Alabama, they have a wingspan of 48 to 60 inches and weigh between 2 and 3.8 pounds. 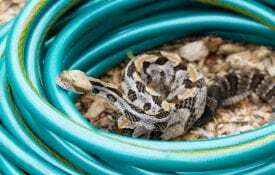 They are brown with gray mottling on their back and breast and have white necks. Armstrong said that great horned owls use a variety of habitats. Great horned owls usually spend most of the day perched in a protected area or tree. They are active mostly in the early evening and early morning hours. The Cornell Lab of Ornithology is a great resource for information on owls and other birds. To learn more about the great horned owl, visit the Cornell Lab of Ornithology’s All About Birds website. As their name implies, people often find barn owls in the loft of a barn. These owls only hunt at night and prefer open country land for hunting. 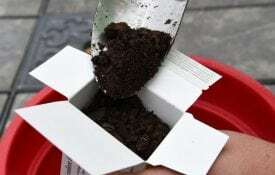 Because they feed almost entirely on rodents, people often find them near old fields, farmyards, grain elevators and in any area that may attract mice and rats. This owl has a white to light cream colored breast and belly and may have brown spots. Their back is pale-yellow with streaks of gray. Armstrong said that barn owls have a distinct face. 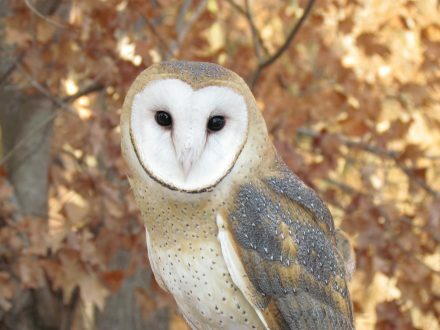 To learn more about the barn owl, visit the Cornell Lab of Ornithology’s All About Birds website. Weighing in at only 2 ounces, the Eastern screech owl is the smallest owl in Alabama. Small but feisty describes it well. They are surprisingly aggressive for their size and can take down prey as large as themselves. 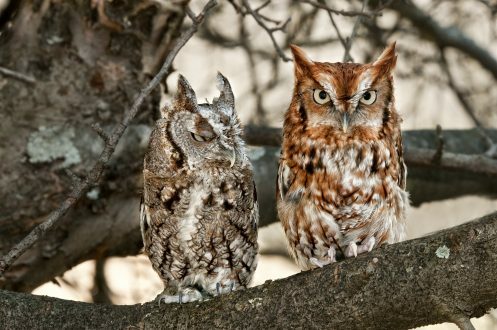 There are two different color phases in Eastern screech owls; red and gray. The red color phase owls have a red-colored back with black streaks and an orange face. Gray color phase owls have white faces with brown spotting. Their backs are brownish-gray with white or brown streaks. Armstrong said that unlike other owls, these do not build nests. To learn more about the Eastern screech owl, visit the Cornell Lab of Ornithology’s All About Birds website. The most distinguishable thing about barred owls is their wide range of noises. Armstrong said that people can often imitate these owls. Barred owls commonly live in swamps and marshes. They may also been seen or head in wooded areas in neighborhoods. Because they are primarily nocturnal, they prefer thick forests where people will not disturb them during the day. Barred owls nest in natural tree cavities or take over old hawk nests. They seldom build their own nest. To learn more about the barred owl, visit the Cornell Lab of Ornithology’s All About Birds website. 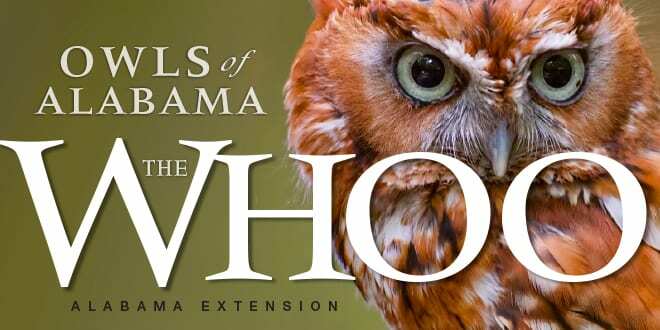 For more information about owls and other birds of prey, download the Alabama Extension publication Southeastern Birds of Prey.